I've written before about how much I love Boon products. They are not only snazzy-looking, but extremely well-conceived and kid-friendly. Boon has recently launched an offshoot, Keen Distribution, to bring similarly attractive and, more importantly, useful kids' products to your neck of the woods. I received two of Keen's initial offerings to review. Grobag is a venerable British baby brand and I was thrilled to see that Keen is making some of its premiere products available stateside. Jasper is a little big for the Grobag Swaddling Wraps and it's not the right season for the Grobag Sleeping Bags (I would LOVE to see him in the jellybean striped Grobag this fall), but I was anxious to try the Grobag® Egg™ Color Changing Digital Room Thermometer. This nifty device functions as a gently glowing nightlight but it also tells you the temperature in the nursery, both on an LED screen and by its color. Along with its charming sci-fi aesthetic (perfect for a Star Trek nursery! ), the Egg is a simple way for sleep-deprived parents to determine how much swaddling, if any, baby needs. Poor Jasper. The Egg stayed in the red zone in his room and the frowny face on the LED coerced his stingy mommy into lowering our AC thermostat a couple of degrees until the Egg turned a more relaxed orange. I suspect we will be battling the blue Egg all winter! (We just got window replacement estimates in the hopes that switching the pre-1960s windows for higher efficiency new models will make our comfort levels, and energy bills, improve.) 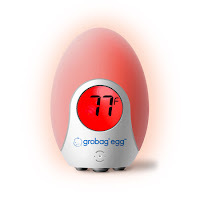 The Grobag® Egg™ Color Changing Digital Room Thermometer is also available online at Giggle. 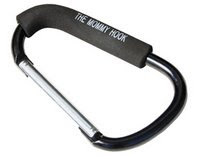 The other new product we tried from Keen Distribution is The Mommy Hook. It's essentially a giant carabiner clip with a foam comfort grip that you can use to collect grocery bags for easy carrying, hang stuff from your stroller, etc. My husband tried to steal it, saying it would be perfect for storing extension cords in his studio. Dude, it's not the Daddy Hook… Well, I suppose it could be, but I'm not giving it up! If you've ever looked at your baby's toy links and thought it would be great to have one to keep all of your stuff together, The Mommy Hook was made for you. And at only $8, it could be the cheapest baby gear you ever buy. I especially like it for tethering the diaper bag to the shopping cart. 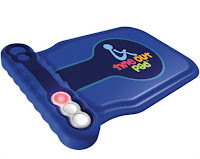 I haven't tried the Time Out Pad, but it is very intriguing, especially since Supernanny is a guilty pleasure of mine. It's a pressure sensitive seatpad with a timer built in. It's small enough to take almost anywhere, unlike a stool or a corner. Ingenious! Keep checking Keen Distribution for great new products. I wanted to tell you that we are alive, though not kicking (that would require a time out for some of us). Keen Newport - Womens - The Newport is the foundation of the Keen Footwear line. Designed to perform in adverse conditions, the razor siped outsole and 3mm lugs provide excellent traction. A true hybrid, the waterproof uppers withstand the abuse of saltwater and dirt, while providing supple comfort and stylish looks.